Speedball-Pop In Soft Rubber Roller Brayer. Brayers are great for printmaking, scrapbooking, paper crafts, home decor, and much more! This 4in brayer comes with one soft rubber roller that is easy and quick to interchange. Featuring a rubber roller (tan) for printing projects. 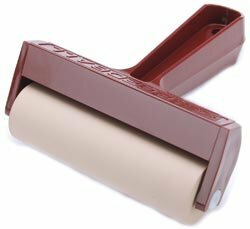 Brayer has a burgundy colored plastic handle. Measurements: Brayer handle with no roller: 4-1/2x4-1/2x1-5/8 inch; roller: 1-1/8 inch diameter. Made in USA. Manufacturer: Speedball Art Products, Inc. Publisher: Speedball Art Products, Inc. Studio: Speedball Art Products, Inc.
View More In Etching Supplies. If you have any questions about this product by Speedball, contact us by completing and submitting the form below. If you are looking for a specif part number, please include it with your message. U J Ramelson Etching Needle medium stylus 7 in.